...and much more! We believe in delivering lots of value for your money, so the OAE English Language Arts (020) Flashcard Study System is packed with the critical information you'll need to master in order to ace the OAE English Language Arts exam. Study after study has shown that spaced repetition is the most effective form of learning, and nothing beats flashcards when it comes to making repetitive learning fun and fast. OAE English Language Arts (020) Flashcard Study System uses repetitive methods of study to teach you how to break apart and quickly solve difficult test questions on the test. Our flashcards enable you to study small, digestible bits of information that are easy to learn and give you exposure to the different question types and concepts. With our flashcards, you'll be able to study anywhere, whenever you have a few free minutes of time. Our company has helped thousands of people achieve their education goals. 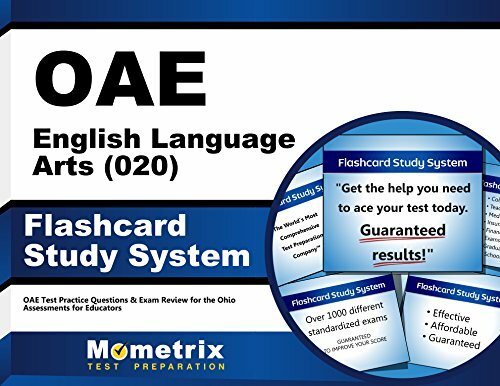 OAE English Language Arts (020) Flashcard Study System can help you get the results you deserve. View More In Test Flash Cards. If you have any questions about this product by Mometrix Media LLC, contact us by completing and submitting the form below. If you are looking for a specif part number, please include it with your message.